The LGU initiates the Umpire Process by identifying responsible parties. The law authorizes the LGU to access documents pertaining to the property’s contamination and requires the LGU to maintain these records in a publicly available place. The LGU then drafts a preliminary Remedial Action Plan (RAP) in consultation with the DNR and conducts a public hearing on the RAP. Following the hearing and comment period, the LGU considers public testimony and submits a revised preliminary RAP to the DNR. 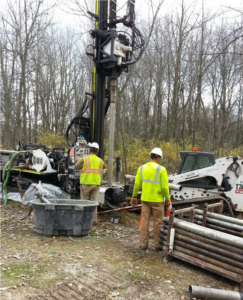 Monitoring well installation at Manitowoc-Newton Gravel Pit site. The city of Manitowoc initiated the umpire process at this site at the end of 2017. After the DNR approves the RAP, the LGU serves an offer to settle to the responsible parties that it has identified, detailing the RAP and the investigation and remediation costs. The LGU then notifies the DNR, prompting the DNR to select a qualified and disinterested umpire to facilitate negotiations between the LGU and responsible parties. The umpire facilitates negotiations over a 60-day period, during which parties can enter agreements to apportion costs. Following negotiations, the umpire makes a recommendation that covers the LGU and any parties that did not reach agreements. The umpire then submits the recommendation to the DNR for approval. In addition to providing this process, the LGU Negotiation and Cost Recovery law offers parties incentives for cooperation. Responsible parties that comply with either a negotiated agreement or an umpire recommendation are not liable to the LGU, the state, or other parties for further remediation costs. Responsible parties that reject an umpire’s recommendation may become subject to a law suit from the LGU, and the payment of the LGU’s legal fees and interest on any court-awarded judgement awarded to the LGU, provided that the court awards an amount equal to or greater than the umpire’s recommended amount. Responsible parties that enter an agreement or accept an umpire recommendation and then do not comply may also be subject to legal fees and interest if a court awards an amount based on the agreement or recommendation. The Umpire Process has recently helped two LGUs in northeastern Wisconsin take charge of their contaminated sites. In late 2016, the Village of Ashwaubenon in northeastern Wisconsin successfully settled its cost recovery claims during the negotiations process with each of the responsible parties identified. As of February 2018, the city of Manitowoc entered negotiations for cost recovery with most of the parties settling during negotiations. Cleanups at both sites are currently underway. For more information about the Umpire Process, contact Molly Schmidt, MollyE.Schmidt@wisconsin.gov or (608) 267-7500 .